Mary L. Ball, I am looking forward to reading Stone of Destiny! The story sounds amazing. Mary, your title sounds interesting. I like the idea of following the trail of an heirloom. Mary does such great work. What a mind ! I have been looking forward to her new book ever since I first heard about the storyline. Mary Ball's Stone of Destiny excerpt takes a Christian believer out of the box. Mary Ball is an excellent author. I am looking forward to her next book. Stone of Destiny is good reading. You'll love it. 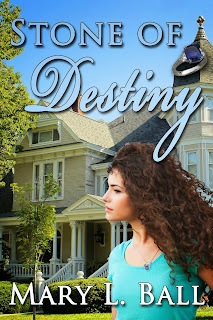 Stone of Destiny by Mary L. Ball is a wonderful story of romance and one finding their way back to God through faith and trust. Taylor Harrison is the youngest CEO at the Mugful Beverage Company and she feels that her life is complete. With great trepidation she agrees to oversee the renovation of her grandmother's family home. Fifty years earlier, a sapphire ring was lost in the house and Granny Kay wants Taylor to search for the ring as the renovations are being made. After finding the ring, Taylor begins to have strange dreams and she is even making phone calls in her sleep at night. Brent Roberts is the nephew of Granny Kay's best friend and he has been hired to do the renovations to the house. When he and Taylor meet, she is definitely not impressed even though she thinks he is the most handsome man she has ever seen. Brent is very much in tune with what God wants him to do with his life. His faith and the way he shares his knowledge of God cause Taylor to start questioning some of her beliefs. She soon realizes that she can only find happiness through a true faith in God. The development of the plot, the characters, the dialogue, and the description of all the scenes were done in an excellent manner. The characters were so real that at times I wanted to shake Taylor and would not have minded if Brent gave me a hug. Granny Kay is the kind of grandma that everyone would love to have and her love for Taylor was a very important part of the story. All the action taking place in the book was so well done that in my mind I was struggling right along with Taylor as she worked to make her decisions and I was pulling for Brent to win Taylor's heart. I really appreciate the way that the author handled the romance in the story and how Taylor regained her faith in God and finally trusted Him with her life. Searching for the missing ring added a little suspense to the story. This is the second book by Mary Ball that I have read. The first one was a mystery/suspense that had me guessing all the way to the end. This one had me intrigued and wondering all the way to the end what path Taylor was going to choose. This story starts out with a bang, literally, and I was wondering how I was going to put this book down to sleep that night. I love decorating and watching HGTV so I was especially interested in Mary's description of how this old house was being renovated by our very special hero. This book also takes place over a period of time so it is not an insta-love, but one that grows. Though sometimes I did get aggravated with Taylor for some of the choices she was making that would have resulted in a very lonely life.